Tuesday morning. Sun’s out. Let’s get those legs down again. As usual a bit of a last minute decision to take the caravan out. 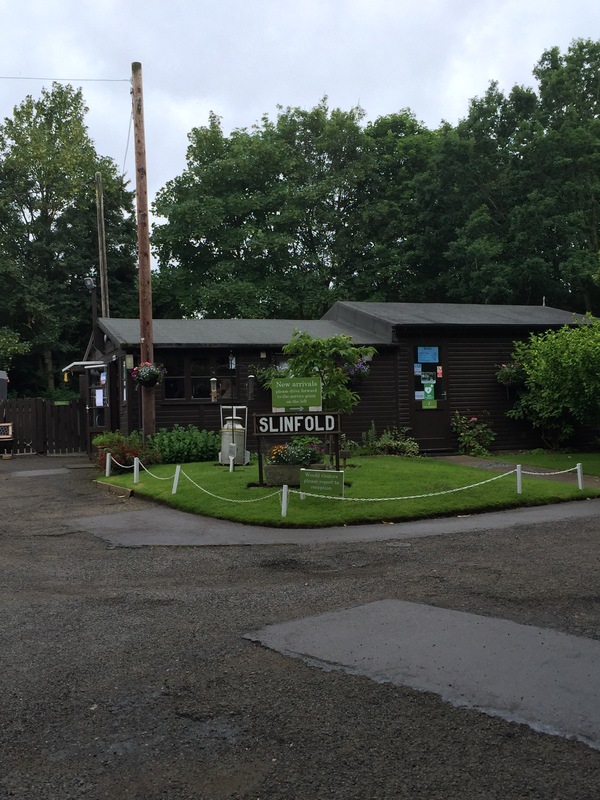 I’d been itching to get back to Slinfold CC site and today seemed like a good day to go. Quick phone call and we had secured a pitch for 2 nights. The site is located on an old railway line on the South Downs Link, making this site perfect for cycling and walking. The site is volunteer run and has no toilet/shower block. A mixture of grass and hard standing pitches on this site we like a grass pitch. A long site with the far end backing onto a small industrial unit we have found the pitches nearer to the wardens office don’t hear the sounds of the occasional truck or workers going about their business. I must add that it is only a small unit and noise is minimal anyway. 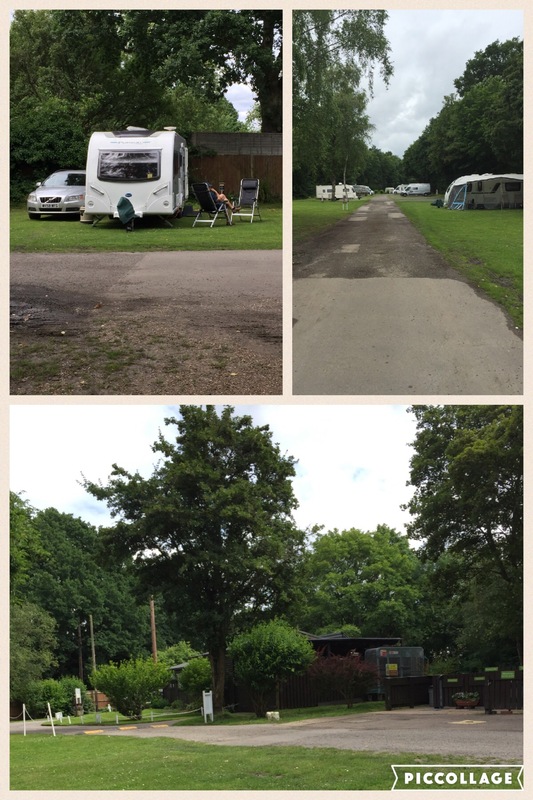 The site is well established and cared for and the wardens are very helpful and chatty. The site is located at the far end of a single track road so it is advisable to arrive after their 12pm recommended arrival time as you really wouldn’t want to meet another unit departing. Set up was done and dusted in no time with me doing the inside and the boss doing the outside jobs, of course. Lunch made, time to sit in the sun and relax. With rain forecast later we decided to walk into the village whilst the sun was shining. 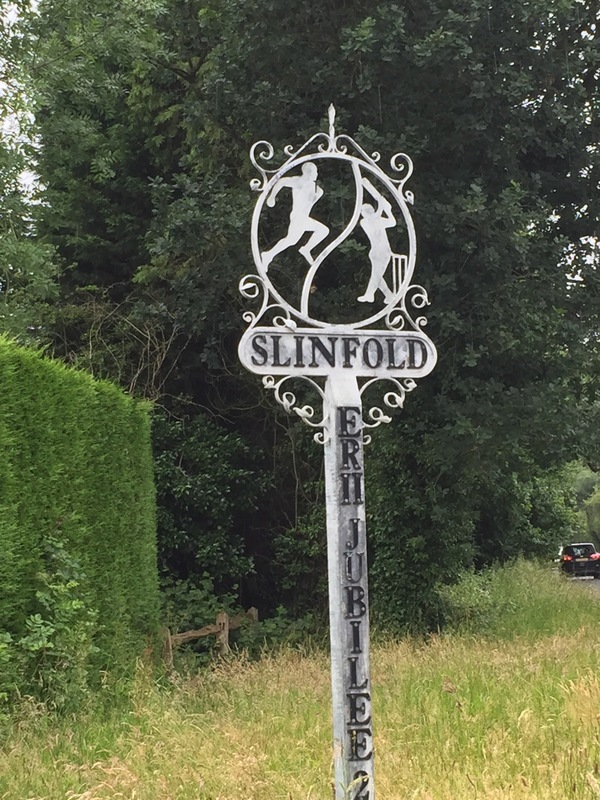 A short walk and we were in the very quaint and typically English village of Slinfold. Stone roofs and cottage gardens teeming with flowers and heavy with the scent of summer. 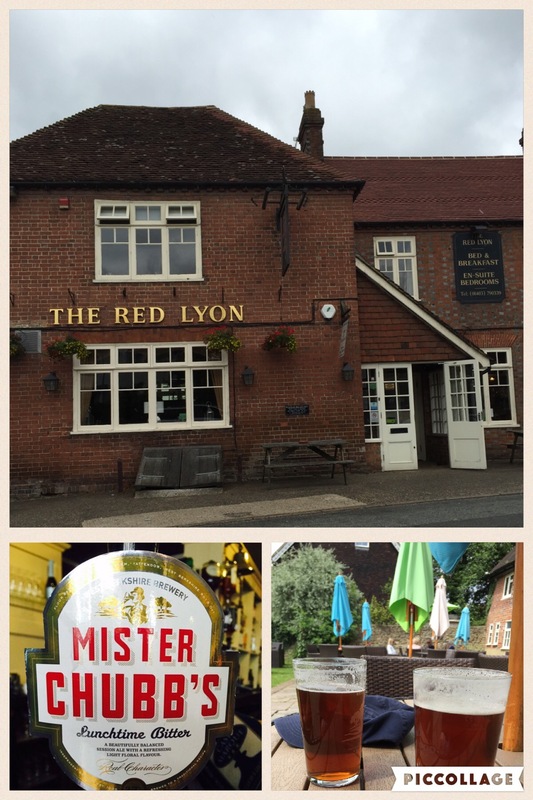 A small local store selling essentials sits opposite the local hostellers, The Red Lyon, offering B&B, food and a beer garden. It would seem rude not to partake in a local tipple. Met by a very cheery couple of locals on our side of the bar who were more than happy to advise which ale to sample. A pint of locally brewed Mr Chubbs was selected and taken to the garden. 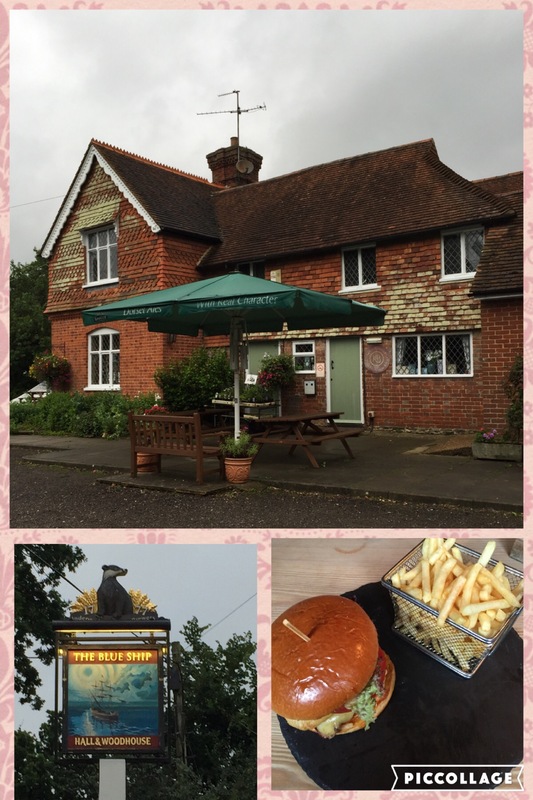 A lovely pub, well worth a visit on a sunny afternoon also offering quite a substantial menu for lunch and dinner. Being a bit tight, at £8+ for 2 pints, needless to say, we only stayed for one. Shortly after our little jaunt into the village the rain started. Tucked up warm and dry inside our little tin box, time for an afternoon siesta and to watch the evening creep in. The day dawned with bright sunshine. We knew from the forecast that the weather was going to be short lived and that rain was rolling in from lunchtime onwards. A first today in the Pursuit. We used the shower. Pretty impressed with water pressure and space within the cubicle. In an attempt at preserving our water supplies we only had the water on when needed and were pleasantly surprised that the aquaroll we filled on arrival yesterday sufficed. As regards the shower area a shelf or two for shower gels and shampoo would’ve been a nice added extra. As it is with only a soap dish our toiletries were banished to the floor. Nice to know though that we can survive comfortably and confidently on smaller sites without the usual facilities. Just before lunch the predicted weather drizzled in. 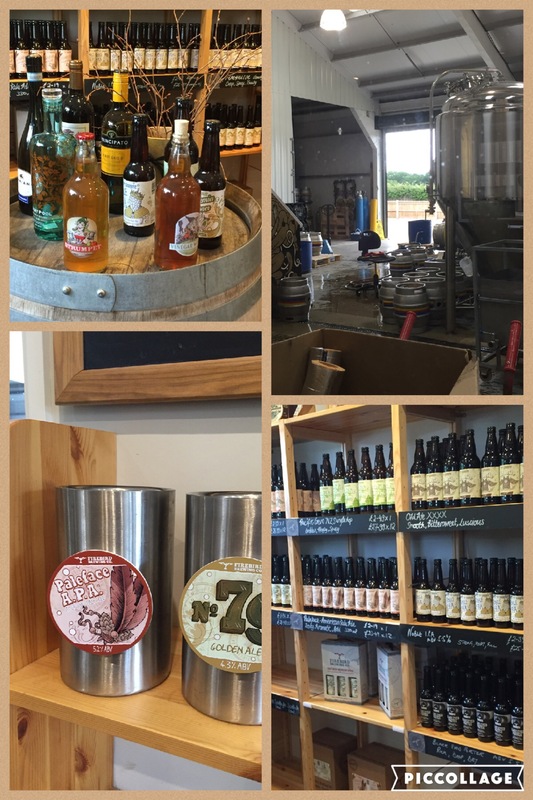 On a previous visit to this site we had cycled a few miles on the South Downs link to a local brewery and bought a sample of their wares. This time our chosen method of transport due to the weather was the car. 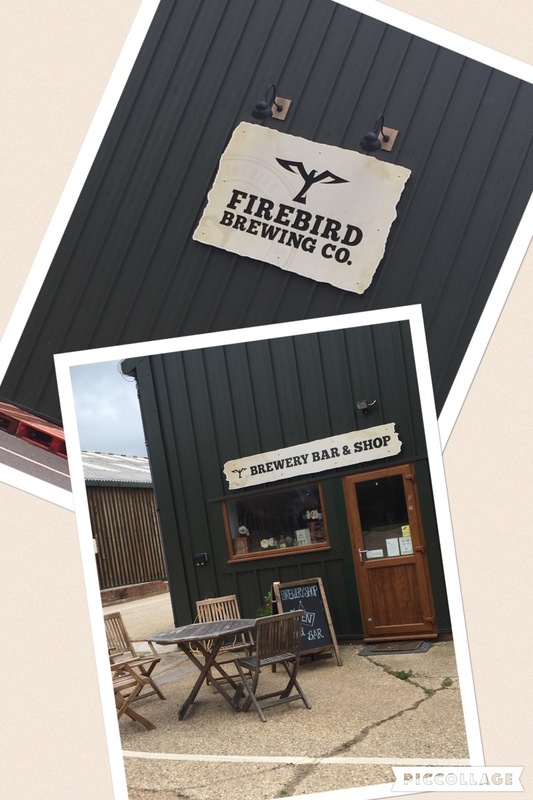 In the neighbouring village of Rudgewick is the Firebird Brewery. A typical micro-brewery, a small industrial unit with a small unmanned shop (hand bell on counter to summon assistance) and mini-tours available twice a week. Today we were definitely “buying” so aimed for the free taster jugs where you can sample all the available ales. We opted for 2 litres of ‘No79’ and 1 litre of ‘Pale Face’ (just enough to see us through a rainy afternoon in the caravan). We also came away with the added bonus of a free bin, ie, a carrier bag, a win win. Really helpful and chatty staff and being able to watch them brewing through a huge window in the shop added to the whole experience. As I write this, our beer drinking strategy may be risky as we are out for a meal tonight with a good friend and meeting his girlfriend for the first time. Perhaps the risk is entirely his, as we may be totally oblivious to the outcome of the evening. I can just imagine the comments in their car later, “..and you actually know those people”. Maybe a siesta is required before tonight, I’m sure we will be on best behaviour, will let you know in a later paragraph. Sat here in a haze of Paleface and No. 79 and an elderly neighbour decided that despite the weather now is the time to do the ‘blue jobs’ and fill the water with a deggin’ can (only a true northerner will recognise this term). Empty the loo and the waste. Countless trips up and down later he is drenched and decides to take the dog for a walk. The dog is obviously bursting but isn’t allowed to pause to even smell the raindrops let alone make a puddle. Marched off the site to dutifully do it’s ablutions it is then marched quickly back to have it’s paws dried thoroughly before re entering the caravan. The neighbour though still obviously not quite as wet as he could be stomps past us again carefully skirting past the puddles to the on site information office. StopPress. Just had a laugh as the old boy tripped up over a speed bump, that will teach him to break the 5mph rule. Firebird’s finest dutifully slept off. Time to get ready to go out for dinner. Our friends collected us from the caravan site and drove us to our chosen eaterie, The Blue Ship. Famed locally for a ‘challenge burger,’ we chose the smaller alternatives. A typical English village pub with great hosts and an extensive menu all good portion sizes and prices. We arrived early and had the place to ourselves and were able to catch up and chat with ease, no juke box blaring out and no arcade game machine churning out the incessant, irritating music designed to lure kids in and wind up the adults. Our food arrived beautifully presented on slate with a substantial basket of fries. Time to tuck in. People by now had started to drift in and it became quite obvious that their menu was a big draw on custom. Everyone who came in ordered food. Due to our ale consumption in the afternoon we only managed one drink which helped the conversation flow freely. Tums full and all starting to tire we returned to the caravan for coffee. Strange how big the ‘van feels with just the two of us in it yet ever so small with four adults. The day was drawing to a close. Good nights said and promises made to keep in touch more we waved our friends on their way and tumbled into bed knowing tomorrow morning would be here soon enough and time to go home. Would we go again? Of course we would! No facilities, no wifi just total relaxation. Looking back it seems that this was a bit of a boozy mid week weekend for us. Quite unusual really. We like to think of it as keeping local businesses alive by sampling their produce – hic! That’s my excuse anyway and I’m sticking to it. Want to recreate the break you had. Sounded wonderful. Been contemplating this site for a while. Will add to next years staycation maybe.